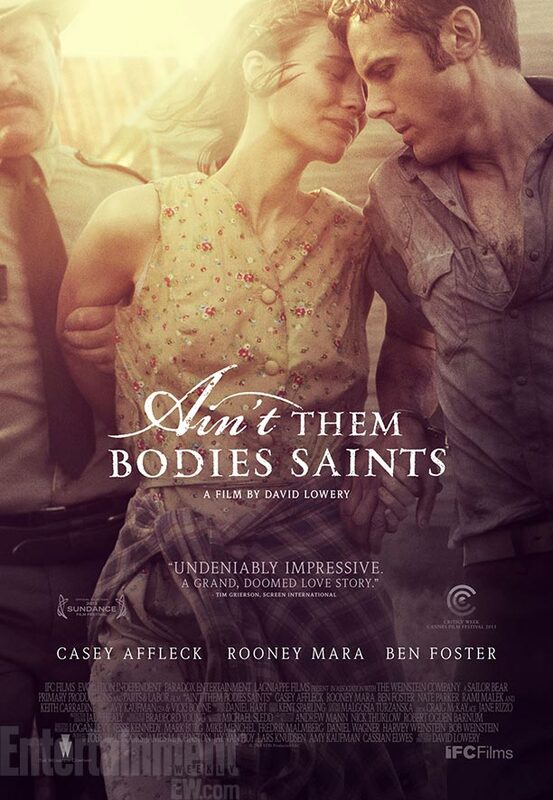 It ain’t like the title “Ain’t Them Bodies Saints” has anything to do with the movie, but it ain’t a bad title either. From Director/Writer David Lowery, this Indie drama and Sundance Film Festival darling is a piece of work. Bob Muldoon (Casey Affleck from Tower Heist) and his gal Ruth (Rooney Mara from The Girl with the Dragon Tattoo) are in love somewhere in 1970’s Texas. She is drawn to him and his dream of a better life. He goes after it the old fashion way: steal it from somebody else. This gets him 25 to life in the state pen with a pregnant Ruth on the outside. After about five years, Bob breaks out, and everybody knows where he is going. Ruth has been waiting for him – and in the most conflicted way I have ever seen. There are no clichés here, just a great understated performance from Mara that makes you want to drive to Texas and take care of her. She fell for this high-spirited guy with the twinkle in his eye and followed him – knowing it could take her down – based on her original decision to love him. Then, she gets the chance to make the decision all over again. When we come into the last act, we don’t know what’s going to happen, but we do know the characters are driving the movie. Their core needs and goals are all that is being served, and the filmmaker does a great job of staying out of the way of the story and not wedging in cute plot twists. None of it felt contrived, and though the movie is not perfect, I would not be surprised to see Mara and Affleck get major recognition for their work here. With a 96-minute running time, the movie worked for my schedule and my patience. But when it was over, I felt like they could have done more. It looked and felt like a Cohen Brothers movie, and it was good, but it needed a few more scenes to make it great. Lowery does such a good job with the imagery and sparseness of the dialogue; the real power of the story and characters were kept from us. The movie is about love, family and a lost kitten metaphor that is just “purrfect.” I can only give this movie 4 stars out of 5, because there was just not enough meat on the lovely bones of these bodies. But keep an eye on this Lowery guy, because he is no saint. 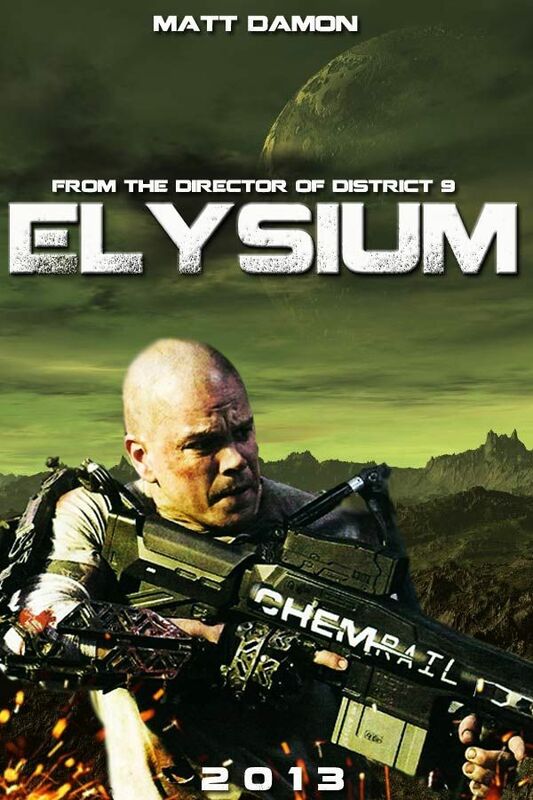 “Elysium” sounds like a prescription for a bad infection, but it’s the new sci-fi thriller opening today from Director/Writer Neill Blomkamp (District 9). The story is set in 2154, when the Earth is all “Detroit-like” and anybody with money and connections lives on Elysium, the orbiting habitat with no humanity for those left on Earth. Elysium is where Max (Matt Damon from We Bought a Zoo) and Fray (Alice Braga of I am Legend) dream of living. Unfortunately Max is now a reformed hoodlum and Fray is a nurse with a daughter who has leukemia. This is a good place to mention that on Elysium everyone has a “healing bed” that fixes everything faster than you can toast a Pop Tart. So everyone who is sick wants to get up there, but it’s virtually impossible. To make sure of that, Secretary of Defense Delacort’s (Jody Foster of The Beaver) main job is to keep out the riff-raff, as they threaten the heavenly way of life everyone enjoys on Elysium. Eventually, Max makes it to Elysium with Fray and daughter in tow. There they must fight for what they want: to save themselves and the rest of the lowly earthlings. It looks a lot like Blompkamp’s “District 9,” as he keeps angling for a cinematic metaphor for everything that’s wrong with society. There are plenty of robots and advanced weaponry, but again, our hero must throw hands, and in this case, robot-assisted hands, to win the day. The movie was interesting, and a decent effort at expanding an old Star Trek-style plot (see Gene Roddenberry) into a feature film. With so much of the budget going to special effects and action set pieces, we are left with little screen time to see our hero struggle with the moral dilemmas. Even Max waits until the last 10 minutes of the movie to say, “I have a plan,” when the whole plot puzzle has been delivered to him. Still, it was better than “District 9,” and it was cool, and now people will believe me when I say Matt Damon is the new Bruce Willis. I am a sucker for sci-fi, so I give this movie 3 stars out of 5. In today’s world of haves and have nots, you don’t have to get to Elysium, but it beats staying in Detroit. 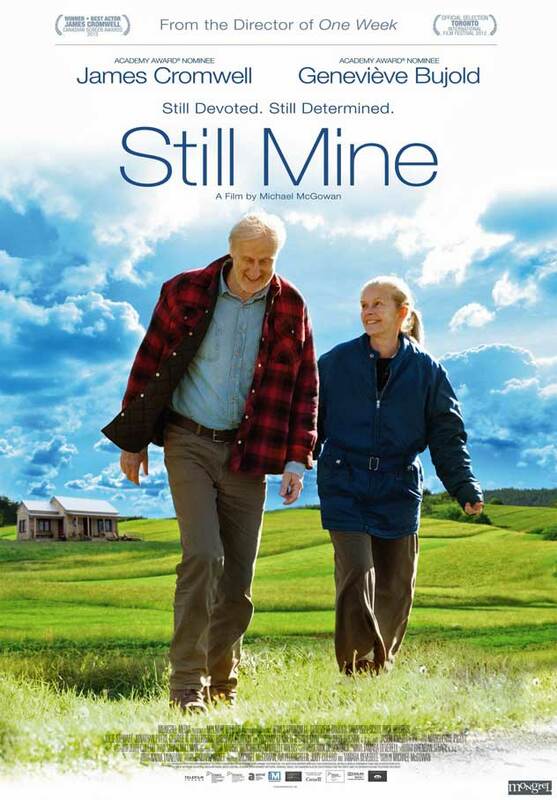 The Indie feature “Still Mine” is hard to find, but six other geriatrics and I saw it this afternoon. The movie is new, but the people in it are very old. Michael McGowan (Saint Ralph) wrote and directed this little gem, which is based on a true story in Canada. Craig Morrison (James Cromwell from I, Robot) and his wife Irene (Geneviève Bujold from Disappearances) have been together for 61 years. They live on a farm and don’t need any help from their seven children or anyone else. When Irene’s health starts to decline, Craig decides to build a new, smaller, one-level house for them. The building permit process annoys him, but he eventually gives them a set of plans and starts to build. By this time he has pissed off the building official because all his wood came from trees on his property and did not have nice little grading stamps. He also does other things the old way, so they issue him a stop work order and threaten to put him in jail and bulldoze the house. I have to tell you, in my expert opinion, Craig built a good house. He even got a bunch of other experts to certify that his work exceeded the code requirements and was structurally sound and safe. The government did not agree, and Craig kept building while they warmed up the bulldozer and a jail cell. This movie may not have a lot of appeal for people under 50, as the lead characters are in their late 80s. I do think it is a good parable about where ones principles come from, and how they are measured. Craig’s work is excellent and the end product is superior to any other new house. However, it does not fit into the cookie cutter pages of the bible that the building official thumps. Every piece of the house is built with Craig’s own hands, using skills taught to him by his father. Craig knows he only has one house left in him, and he needs this house very soon for Irene. Both Cromwell and Bujold give stunning performances, almost up to the “On Golden Pond” caliber. The movie is visually gorgeous and seems to get by just fine without any explosions, CGI or aliens. Some of you young whippersnappers may find it a little slow, but it’s just a good old fashion movie about some good old fashion people. And for that, I give this movie 3 ½ stars out of 5. 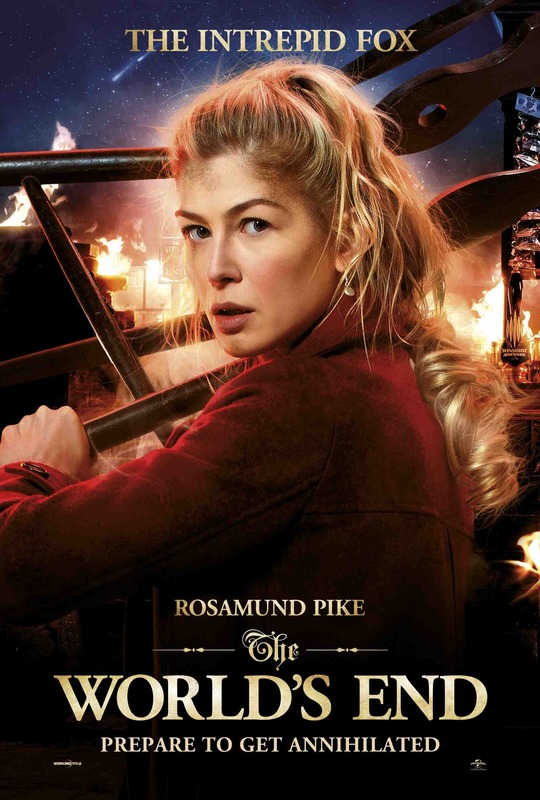 If you need reading glasses to find this movie, I highly recommend you see it.